Emilie Rose Macaulay (1881–1958), made Dame in 1958, was the author of 23 novels, the last of which—The Towers of Trebizond (1956)—is probably the most acclaimed. Some are borderline fantasy, such as And No Man’s Wit (1940), in which a mermaid features. What Not: A Prophetic Comedy (1919) was a near-future satire about a future autocracy in the UK. Mystery at Geneva: An Improbable Tale of Singular Happenings (1922) is set in a near future where the Bolsheviks have been replaced by a monarchist counter-revolution; a reporter (a woman in drag) helps save the League of Nations from a communist conspiracy. Orphan Island (1924) is a borderline Utopia, and a satire like the two preceding novels. For more information, see the Encyclopedia of Science Fiction. 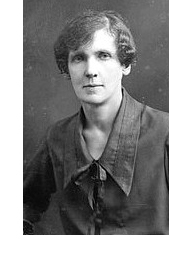 Rose Macaulay was born at Rugby in 1881, the second of the seven children of George Campbell Macaulay (1852– 1915), assistant master at Rugby School. As a child (a tomboy “who believed she would grow to be a man”, as Constance Babington Smith put it), she spent seven happy years in Varazze, on the coast near Genoa. When the family returned to England in 1894 she went to school in Oxford, and in 1900 proceeded to Somerville College, Oxford. She read history, and fell in love with the seventeenth century in particular: much later she would write They Were Defeated (1932), an historical novel about the poet Robert Herrick, and a well-received biography of Milton (1934). In 1905 her father was appointed to a lecturership in English at Cambridge, and from 1906 the family lived at Great Shelford, just to the south of Cambridge. It was the year in which Rose Macaulay’s first novel appeared. By 1914, she had written six, and The Lee Shore was awarded first prize in a competition in 1912. The very large cash award—£600—enabled her to buy a flat in London and start an independent literary career. After the war she worked as a publisher’s reader for Constable, and established a reputation for herself as a witty and thoughtful novelist. Potterism (1920) was her first best-seller, and Told by an Idiot (1923) was another success. In 1935 she started a weekly column in The Spectator. She was a voluntary part-time ambulance driver in London during the Second World War, and she lost her entire library and belongings when her flat was destroyed by a bomb. What was worse was that she had to witness the slow death of her much beloved Gerald O’Donovan, who died in 1942. She published no books during the war, but started writing again afterwards, with a number of travel books, and then with novels. After the war, and after her sense of guilt over her association with O’Donovan diminished, she rejoined the Church of England. Her last novel, The Towers of Trebizond, is narrated by a woman who was estranged from the Church because of her adultery, and is about her eccentric aunt’s attempt to convert Muslims in Turkey to Anglicanism. It is a very funny book, and was a great success on both sides of the Atlantic. In 1958 she was made a Dame of the British Empire; in that same year she died, suddenly, at home in London. She left instructions that all the papers in her flat should be burned unread. Her sister Jean, together with Constance Babington Smith, gave a particular interpretation of this instruction, and the three volumes of letters written by Macaulay, edited by Constance Babington Smith (London: Collins, 1961, 1964, 1968), starting with Letters to a Friend, 1950-1952, were seen by many to be a betrayal of someone who had been a very private person. I am relying largely on Constance Babington Smith’s entry in the Oxford Dictionary of National Biography, revised by Katherine Mullin, supplemented by Sarah LeFanu, Rose Macaulay (London: Virago, 2003).